The Subiran Regattas Committee headed by Tanauan Mayor Roque A. Tiu, is calling for individuals who would be interested to participate in the sailboat race, in line with the forthcoming Pintados-Kasadyaan Festival 2010 for the feast of Santo Nino de Leyte. Mayor Tiu said that once more, the Subiran Regatta will be conducted on June 28 at the Family Park along Magsaysay Boulevard in Tacloban City, as a special feature in this year’s Leyte Pintados-Kasadyaan Festival. The Leyte Subiran sailboat race is the first of its kind in the whole province of Leyte. First incepted in 1975, it revived the sailboat regatta as a sporting event. A regatta, as defined by Webster’s New World Dictionary, as a meeting for boat races. Subiran, in the Waray dialect means attractive and colorful native boats, slim outriggers with single sails, painted and decorated with buntings of many hues, commonly used by Visayan fishermen for fishing and traveling short distances along the coast. 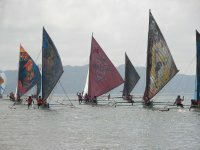 Leyteños will flock once more to the shore of Cancabato Bay along Ramon Magsaysay Boulevard to witness this unique race of boats, which is considered to be environmentally-friendly because the fishermen use sails in running the boat. To ensure fairness, Mayor Tiu always assign the Region 8 coast guards at every point to record a certain area being reached. In the words of Mayor Tiu, "Despite the rains and big waves, the participants bravely sail on. The boats run without the use of gasoline and engine. They are environmentally-friendly." The aim of this competition was to enhance the skills of boatmen in the use of sails and more importantly, to promote tourism in the province of Leyte and Samar.